Monday starts out nicely at 14:00 with EuroRV3, the international EuroVis Workshop on Reproducibility, Verification, and Validation in Visualization, which as we mentioned previously, has a special edition focusing on medical visualization with the theme “From Medical Visualization Concepts to Certified Applications”. You can find the full EuroRV3 program here. I’ll even be chairing the first session, so don’t miss my debut as a session chair ;). On Tuesday the EuroRV3 fun continues from 8:50, with two more sessions. We’ll be presenting a paper featuring 2/3 of the medvis.org contributors as authors, festively entitled “An Introduction to Evaluation in Medical Visualization”. After lunch at 14:30, Anders Ynnerman will deliver a spectacular keynote on OpenSpace. I know it’s not medvis, but Anders is an excellent speaker and you don’t want to miss this, I promise! At 16:10, there is an interesting session on Volume Data Applications, but the Prediction and Forecasting has a VA medvis presentation as well… Decisions decisions! Ludvig Paul Muren, Uulke A. van der Heide, Jarle Rørvik, Marcel Breeuwer, and Anna Vilanova. At 14:00, the Volume Data Visualization session is looking good! No medvis in the 16:10 sessions. Imagine that! No clear medvis in the 8:50 session this time, but if I’d have to choose, I’d go with the short paper session on Human Computer Interaction. There will be a capstone at 11:00 by Elmar Eisemann, who I can tell you from personal experience is also an excellent speaker! 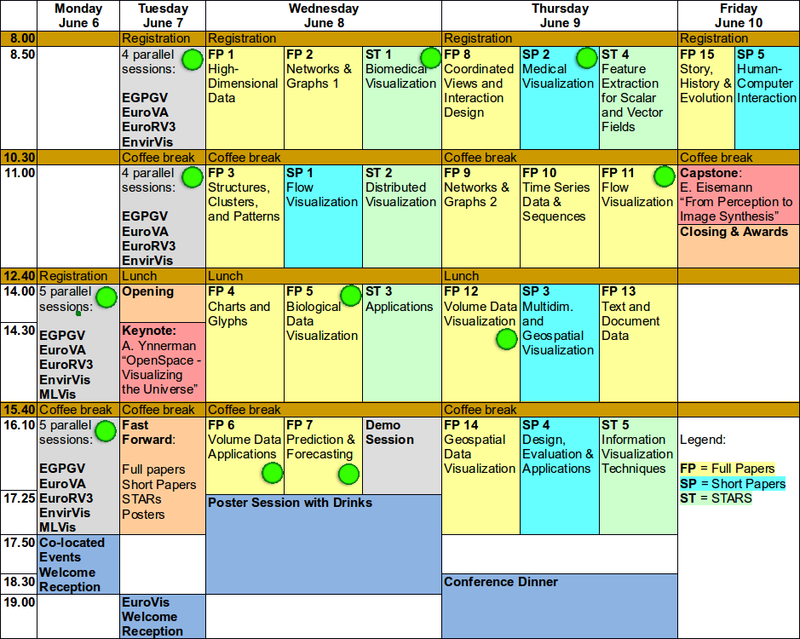 I added green dots to the sessions featuring medvis that I spotted. Did I miss any? Let me know in the comments section! Looking forward to seeing you at EuroVis 2016! This entry was posted in Conferences and tagged eurovis, groningen, preview by Noeska Smit. Bookmark the permalink. Hi! My name is Rishi Kamaleswaran and I will be presenting PhysioEx, a visual analytic tool for physiological event stream. I evaluate this tool with neonatologists and received good feedback. I’m presenting this during the FP10 Time Series & Sequences slot. Would love to hear your comments on my presentation if you are able to attend!